World's Biggest Coin Hits Market the largest legal tender piece of money in the world, thereby eclipsing the old European record. The coin in question, with a face value of $1 million Canadian, was issued last week, and three people have already grabbed one of their own, although it's doubtful they ambled off with it in hand without help, or at least a sturdy wheelbarrow. This monetary item, issued by the Royal Canadian Mint, is twenty inches in diameter and one inch thick. It's made of 99.999 percent gold bullion and weighs 220 pounds (100 kilograms). One side of the hefty coin has the face of Queen Elizabeth and the reverse shows a cluster of maple leaves, one of Canada's most well-known symbols. Its scalloped edge is reminiscent of the country's old-style nickels. The side with the maple leaves has the English words "Fine gold", then "100 KG", followed by the French words "Or pur", which translates as "Pure gold". One of these coins takes six weeks to make. 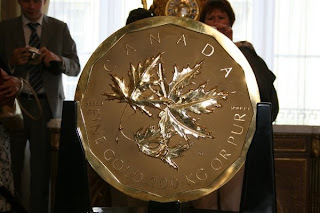 The editor of Canadian Coin News, Bret Evans, said, "They're (the Canadian Mint) not doing this because there is a huge demand for 100-kilo gold coins. They're doing it because it gives them some bragging rights in having the largest pure gold coin in the world. They'll kick the Austrians out of the Guinness World Book of Records". Canada's mint will get a higher international image because of this coin, it's believed. 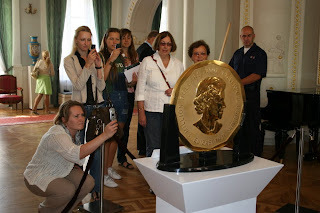 The previous record holder for large coins was the seventy pound 100,000 euro piece from Austria with a fifteen inch diameter. One interesting note about the new coin is that it can't be bought for face value. Getting one for yourself, because of the rising cost of gold, currently means you have to shell out roughly $2.7 million Canadian. Of course, if the price of gold should tumble, your coin may be worth less than face value by weight, although it will always be redeemable for that million dollar value. So you may be interested in investing in gold. If you’re like most people you may look at investing in gold stocks or small gold coins. If you are on the uber wealthy side you may look at putting this $1 million dollar coin in your pocket. Beware though you’re going to need bigger pants than you already own. The $1 million dollar gold coin is made from 99.999% pure gold and weighs over 220 lbs. 3520 ounces/$1 million usd = $284 usd per oz. It looks like this gold coin was valued with gold at $284 per oz. Gold is currently trading for $730 per ounce. If we multiply 3520 ounces by $730 we get a value of $2,560,600. That’s not a bad investment, spend $1 million and get over $2.5 million dollars in return. If we guess that gold will hit $800 by the end of 2008, that puts that value of the coin at $2,816,000 in physical gold. That’s not a bad way to invest in gold and you won’t need to buy bigger pants as the value of the coin grows.